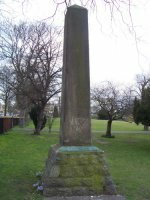 Circumstances of move: Moved to act as a memorial commemorating the gift to the Corporation of Gravesend of the pleasure ground and foreshore by C M Arnold Esq, Mayor 1890-1893. See Benson's A history of Gravesend; or, A historical perambulation of Gravesend and Northfleet . Notes: Originally erected in 1826 to replace a tree which formerly marked boundary (see Cruden's The history of the town of Gravesend in the county of Kent, and of the port of London pp 36-37). The obelisk has no inscription relating to the coal duties or to the Port of London, only a plaque on the plinth recording the gift of Gordon Gardens to the town.